I believe that the ad below contains a symbolic subliminal message. Such a message is transmitted via plainly visible objects or images. If they exist, these messages appear framed to appeal to our baser instincts, fears and faculties. Their producers would know from testing and research that the target audience would psychologically repress them; but would hope that at least a certain percentage of viewers will, while consciously ignoring or rationalizing them, subconsciously recognize and respond to them. The controversy surrounding this type of subliminal stems from a long-running debate over the existence and nature of the subconscious; and from the fact that all things in which humans find symbolic meaning (words, numbers, images, music, etc.) can, and most often do, have multiple meanings. If you doubt that last statement, open any dictionary; you'll see that almost every word listed has multiple meanings. We attach specific meanings from the context in which we find the symbol. When Sigmund Freud famously said, "Sometimes a cigar is just a cigar", I think he meant that in some situations people simply smoke cigars; in others they use them as phallic symbols. Likewise, the objects that convey subliminal meaning in this ad will have different meanings in other contexts. You need to ask, does this specific context give it a subliminal meaning? Smoking Parliament will satisfy any subconscious death wish you may harbor. S/he wants women to buy Parliaments. There is a lot of black and dark blue in the ad. The characters are all men, and are wearing black bowler hats and black suits. Black is a color traditionally associated with mourning and death. The clothing worn by the men would not be out of place at a funeral, or to dress dead bodies for display in open coffins and eventual burial. The suited men all have their backs to us. They are hanging stiffly and lifelessly from numbers. The planet too appears dark and lifeless, no visible clouds or lights. There is red and yellow just above the planet's horizon, colors usually seen at sunset, the traditional "death" of the day. The numbers appear to be carrying the men off the planet and into the sky (i.e. in the direction most people associate with heaven). 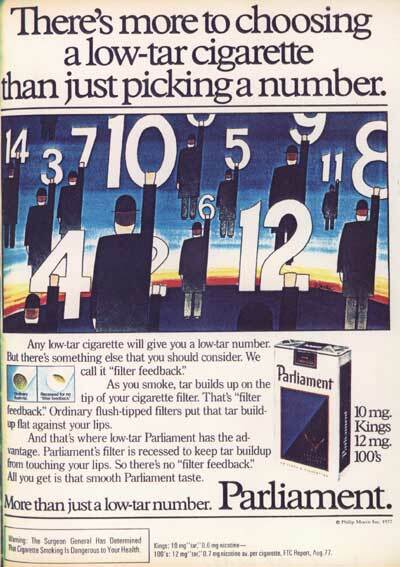 The ad copy indicates that the numbers represent the tar content of different low-tar cigarettes. The message seems to be quite clear, "Cigarettes will take you to heaven." So why would a tobacco company, that had spent decades fighting to suppress research and information about the adverse health consequences of smoking, present a message promising death to smokers? The answer is that the message is a subliminal one. Just like the people in the audiences at my slide show were unable to recognize it until I made it explicit (and some refuse to acknowledge it even then), the advertisers know that death is a very uncomfortable topic for western populations, and that we are taught from infancy to repress thoughts about it. It is also conceivable that they possess psychological research that a certain percentage of smokers have a subconscious death wish. These people would never think of committing a traditional act of suicide, but they might be subconsciously open to the promise of eventual death by smoking. This is very speculative of course, but how else to explain the clear death imagery in this ad, and the fact that most of us were unable to recognize it? This was one in a long-running series of ads. Since advertisers don't waste money on ads that do not generate sales, the longevity of this series attests to its effectiveness.